Water, essential to mankind’s survival, is already a scarce resource. With an increasing global population and ever more sources of pollution, the task of providing people with hygienically safe drinking water is becoming more challenging all the time. In order to provide water with this degree of purity, measurement devices are needed that allow for reliable, online analysis of physical, chemical and microbiological parameters. The turbidity of water is related to the undissolved content in water. This parameter is an indicator of aesthetic condition and of possible hidden microbiological content in of the water. The turbidity can increase in the untreated water, e.g. after rainfall events, and thus require further treatment steps. Furthermore, this parameter is used as a limit value monitoring (1,0 FNU) or for monitoring the filter process in the drinking water. The measurement takes place in a water sample on the basis of unresolved particles. Measure turbidity with sensor type MS05. Free chlorine is used for the disinfection of drinking water or for the oxidation. The measurement serves for the monitoring or control of the disinfectant dosage. Thereby, a high-precision, membrane-covered, amperometric Pt-Pt-sensor measures the free-chlorine concentration of water. The recommended amount of free chlorine ranges from 0,1 to 0,3 mg/L. Our chlorine sensor type MS02 can support you in the measurement. This value is measured for quality monitoring in untreated or drinking water. Water with a pH value of >7,7 is considered as not corrosive. The pH value also serves for the control and monitoring of treatment processes as, e.g. for the deacidification with lye. The pH measurement is based on the ISFET Technology (ion-sensitive field effect transistor). The pH value is the negative logarithm of hydrogen ions activity in a solution and provides valuable information about the water condition. Measure the pH value of your system with pH sensor type MS01. Conductivity provides information about the undissolved substances (e.g. minerals) in water and serves for ongoing quality monitoring. As an example, conductivity varies when adding de-icing salt. Conductivity describes the water’s ability to conduct electricity. This value is an indicator of the quantity of dissolved substances in a water sample. Our sensor type MS03 can support you in determining the conductivity. The ORP/redox values determine the water quality, e.g. the contamination of surface waters, or bacterial metabolism. Furthermore, the mechanism of the disinfectant is checked by the ORP value. The oxidation-reduction potential (ORP) is one of the main water parameters. Measure the ORP value of your system with type MS04 - Redox Sensor-Cube. Intuitive operation and clear visualization. No need for multiple wires and excessive pipework, only one connection for the complete system. Fully automated cleaning of the cubes with freely definable cleaning sequences. Plug&Play Sensor cubes. Easy removal for maintenance, even during operation. The distributed solution offers a flexible and application-related measurement possible at any point of the process. The integrated Fieldbus unit communicates with the central SPS, where all parameters are evaluated. The different sensor cubes can be varied depending on the number and type of parameters to be measured. 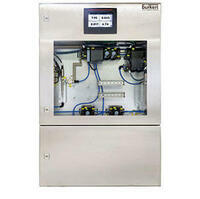 Tailored control cabinets protect your measurement technology against internal influences. The intuitive 7“ display with touch function makes the operation simple and your measured values manageable. Up to 60 sensor cubes can be varied and thus adapt to your measurement challenges. The automatic cleaning units rinse the system automatically after every measurement, which makes a manual intervention unnecessary. A uniform communication interface makes it possible to network various devices with each other and exchange and manage process or servicing information. With EDIP -Efficient Device Integration Platform- the communication between the devices will be more than simple. With the 8905 Online Analysis System, this networking functions down to the sensor / actuator level. This means that the entire process can be controlled easily and efficiently. Fieldbus module ME43 sends values to the higher-level control system (PLC). Type 3361 control valve adds missing liquids or chemicals to the water. ME44 I/O is f(x)*-capable and transmits the data of the added dosing quantities to the control valve, directly installed in the online analysis system. The online analysis system analyses the current values of the water and reports malfunctions. Learn how the Type 8905 Online Analysis System is proving its worth in drinking water analysis for the Grand Poitiers community. Further information can be found in our flyer. Download flyer now.